Visit Bratislava’s Jewish sights and get to know the history of this once important community. You will see the Mausoleum of Chatam Sofer whose grave is the city’s most important Jewish sight. Afterwards we will visit the Museum of Jewish Culture which displays a rich collection of artifacts representing everyday life in detail. You will see where the ghetto was situated and have a look at the Wall of Memories and a picture of the ruined synagogue. 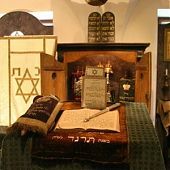 Finally, you will visit the only remaining synagogue in Bratislava and learn about today’s Jewish community.